I don't much like talking about my own depression, and I don't like reading about other people's - certainly not in any detail, anyway. It's ... well, depressing. And more than that, it's just plain boring, in the same way that backache is boring, or indigestion. It’s not some sort of exciting, tortured melancholy of the kind you can imagine afflicting a Romantic poet in a billowing shirt. It’s just painfully monotonous and dully oppressive. This is probably why the only book about depression to have really touched me in any way is Mr Chartwell by Rebecca Hunt (not only my favourite book about mental illness but also one of my favourite books full stop). I'd like to say the second was the one I finished reading at the weekend - Light Boxes by Shane Jones - but unfortunately it fell into the trap of becoming an extended metaphor for the Tortured Creative, letting itself (and me) down considerably. 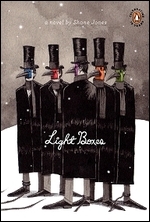 Light Boxes is a poetic, surreal novella about a town suppressed by a seemingly everlasting February. There is a literal February – bitterly cold, dark and grey with no Christmas to look forward to – and a personification of it, a strange, god-like ‘creator’ in the sky who appears to have a lot in common with writers of novels. The townspeople, whose principal interest flight, have been forbidden by February to fly their strangely life-affirming balloons, and their children begin to disappear. Stricken with a horrible sense of desolation, the townspeople declare war on February in a bid to bring the joy and hope back into their lives, 'that sadness will rise from our bones and evaporate in the sunlight the way morning fog burns off the river in summer'. Light Boxes is certainly a book that would benefit from repeated re-reading, as despite its low page count, each carefully crafted sentence is packed with meaning, and there are allusions and imagery to be deciphered in every line. There are constant surprises, too: stark realism will sometimes break through the whimsical fantasy, such as February’s own hopelessly inadequate list of 'possible cures' - 'Yoga and meditation; Consumption of St John's Wort; Mood diary' - and the use of ‘light boxes’ to beat the gloom of winter. There are a number of characters from whose point of view the story is told, although I felt they were ciphers rather than fully-realised individuals, and where I felt Light Boxes became disappointing was when we began to learn more about February himself, who is flagged up not as the personification of depression itself but as an obvious parallel to a miserable writer, creating a fairy tale fantasy world 'to try to cure bouts of sadness', like the ones listed (clunkily) in the middle of the book. Apparently in love with a girl 'who smells of honey and smoke' and desperate to prove something to her, he begins to behave like an Old Testament God, crushing his characters into bleak conformity and meting out vengeful punishments for their rebellions. Certainly the loss of their children and the toxic moss which creeps over everything in its path and kills their livestock have the hint of Biblical plagues about them. Heavily conceptual and low on plot, Light Boxes is surprisingly engaging for what is essentially an extended metaphor in the form of a short novel. But for me, when it all becomes clear that February is essentially the sort of person whom I can imagine live-tweeting his mental anguish, the shrewd truths within this otherwise touching fairy tale are sadly diluted.